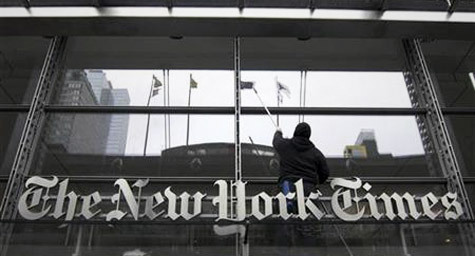 Higher first-quarter expenses are expected for The New York Times. Reuters reports that operating expenses are predicted to rise between one and two percent, mostly due to higher newsprint prices, pension expenses and promotion costs. The Times also revealed that February print advertising revenue fell, yet print ad trends are looking better. The final announcement was that its “pay wall” for the nytimes.com Web site is in its final testing phase and would be launching soon. Many national newspapers are looking for ways to make greater profits from their Web operations, including charging readers for previously free news. As print ad and subscription revenue quickly disappear, newspapers realize that making money online is critical to their survival. The Times has been struggling to develop a process for charging readers for some of the news on its Web site for awhile. The Times also announced that digital advertising revenue rose in the mid-single digits in February, which makes the timing of this “pay wall” launch ideal. Especially considering that the newspaper’s first-quarter circulation revenue is expected to decrease along the same lines as it did in the second half of 2010.